Red Bull Mission Control iPhone App Review. What is Red Bull Mission Control? The iPhone game/app wants you to participate in the things happening in the world around you. Get out there and use your device’s camera, the compass and, via snapped pictures, check-ins or other mini-missions, compete with other people around the world to see who can complete the most missions. Leaderboards are calculated for seven-day periods, so every week it’s your chance to be top-agent. The app will ask you to sign up via Facebook to verify your identity. After you do that, Mission Control will generate your missions for you. Of course, you’ll be starting with level 1 and only a handful of simple missions at your disposal. 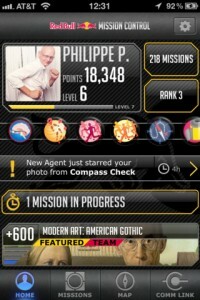 Missions at level 1 can include taking a picture of your secret headquarters (i.e. where you live), making a Red Bull run (i.e. going to your closest shop that has Red Bull and snapping a picture there) or calibrating your compass and taking a picture of a weird object. You earn points for every mission you complete, depending on how fast you complete it as well. 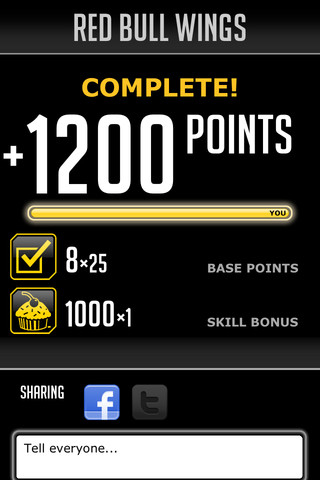 Points add up and when you have enough, you progress to the next level where the next set of missions await you. 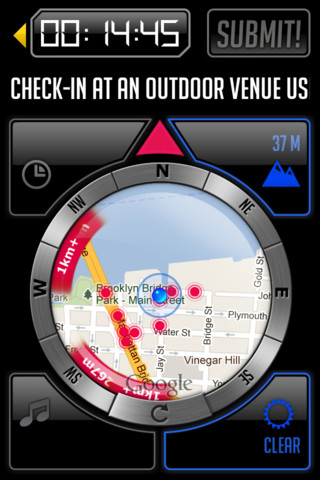 Missions can also depend on the location you’re in. Currently, these features of the app are only available in the US and UK (correct me if I’m wrong though), but that doesn’t mean you can’t use the app. You can still complete missions, earn points and be top-agent. Red Bull is not playing around. Their Mission Control app is one of the better designed apps I’ve seen in the AppStore. It’s responsive, I haven’t had it jam once on me and it’s more intuitive than my previously reviewed Red Bull Racing Spy app. I like the concept of taking your iPhone and trying on real-world experiences. I think we’re all tied down to a chair for far too long. I spend most of my day working in front of a screen, so it’s these moments when I can get out into the “wild” that are as important as ever for me. The one thing that I found was missing from this concept is the possibility to gain actual real-world prizes from your missions. I think a brand like Red Bull could create such an environment and Red Bull fans around the world deserve it. The game is pretty addictive in itself, but, like Foursquare, there’s the initial euphoria of completing mission after mission without seeing a tangible result at the end of the day, save for bragging rights. And sure, vanity is Al Pacino’s favorite sin (sneaky reference to The Devil’s Advocate), and boy do we like to brag about our checkins or whatever, but wouldn’t the brand, in this case Red Bull, win more “adepts” by taking this otherwise wonderful concept one step further? 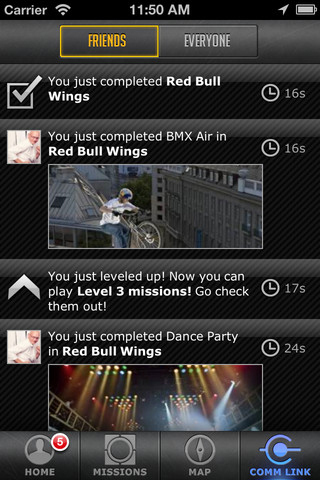 EDIT: I just saw that the app does let you earn certain prizes at specific Red Bull events, when you check in there. Nevertheless, whether you’re in it for the fun of playing the game or the possibility of getting some prizes, Red Bull Mission Control will take your real-world gaming experience to another level. So what are you waiting for agent? Get out there and do some damage! What do you think of Red Bull Mission Control ? Scroll down for our comment section and let us know! The Red Bull Mission Control app is interesting and nice one through which you can participate the things which are happening in the world.